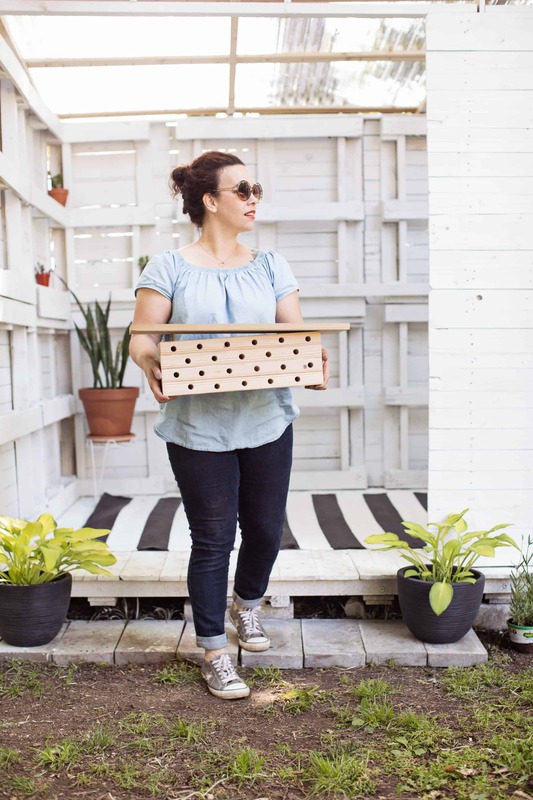 Attracting more pollinators to your flower beds or garden is as simple as setting up an adorable mid-century bee house! Mason bees won’t necessarily show up because they love modern housing, but they do love to nest inside pre-existing holes. This nonaggressive species of bee isn’t big on stinging because they aren’t guarding honey and they aren’t the type that bore holes into your deck. All they bring to the party is flower power—and plenty of it! Set up a sweet little bee apartment block and enjoy knowing you’re helping your garden as well as your neighbors’! 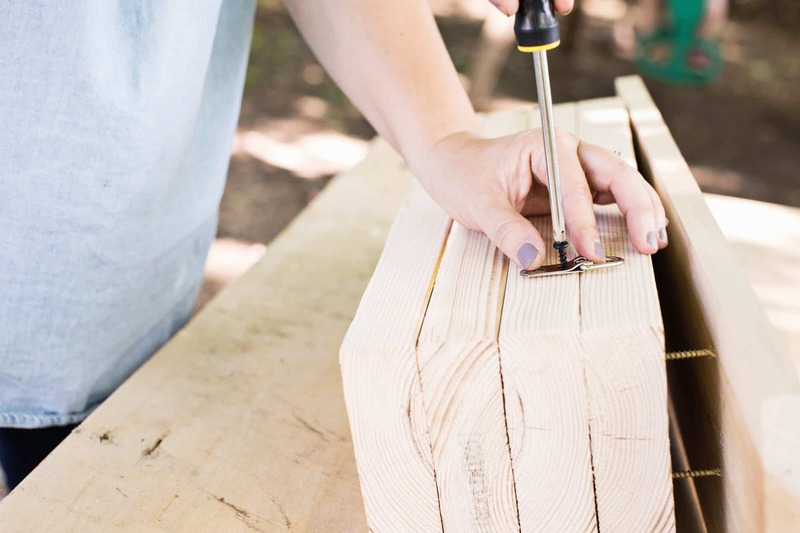 A few things to keep in mind while you’re designing your bee house. Chemically treated wood isn’t a healthy option for your bees, but they don’t like the strong scent of cedar, either. 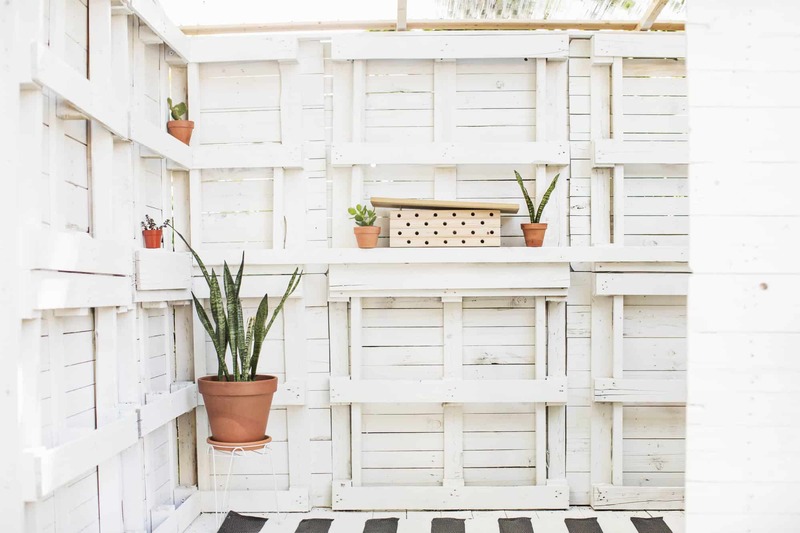 Painting or staining your house might increase its charm but might also leave too much of a scent for bees to want to hang out. This means your bee home will eventually weather, but bringing it indoors from the end of fall to the end of winter will help avoid that. 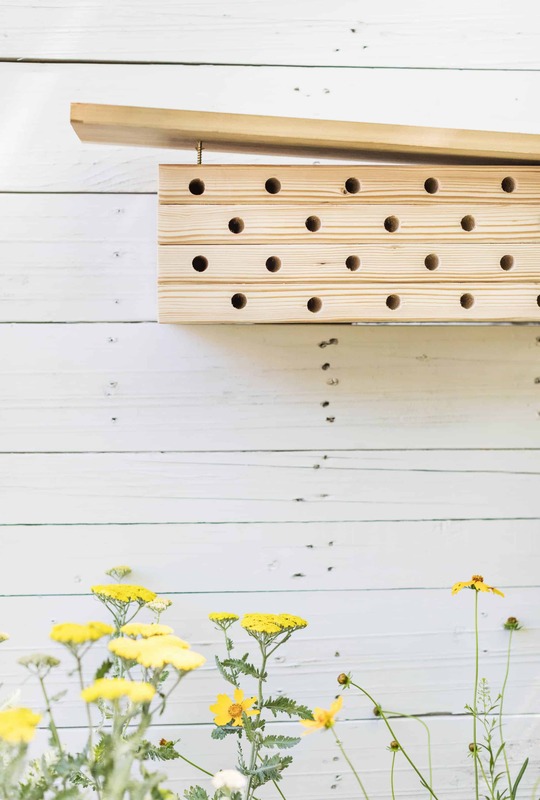 Knowing this, I’ve chosen inexpensive but sturdy wood to design this adorable, mid-century style bee abode. I like to purchase most of my lumber from one of the larger hardware and lumber stores that will make cuts in store but only because I still have an irrational fear of table saws. It’s also great when you get home with your supplies and the first step is already done for you! Whether or not you’re cutting your own wood, make sure your 2″ x 6″ x 8′ board is cut into 18″ pieces. You’ll have a little extra when you’re done. Take four of those cuts and glue them together with wood or gorilla glue. Make sure your ends and edges are even and flush. Attach your clamps and follow the manufacturer’s directions for drying time. 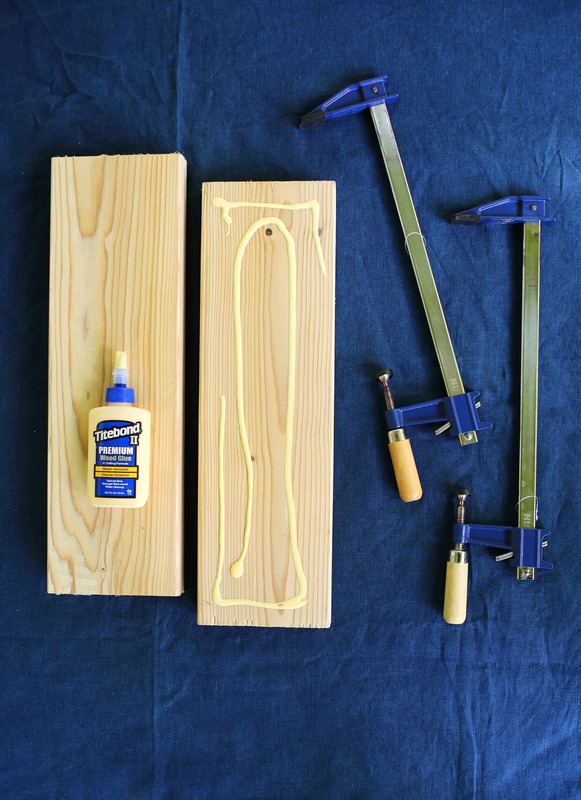 To ensure your four pieces of wood stay attached without waiting for the glue to dry, screw two 6″ deck screws through all four pieces of wood (from the same side). We’re going to be drilling through the sides of each board so that we aren’t drilling through wood glue. Find the center of the side and make a mark on the center of the second and fourth boards. This is your starting point on each board. 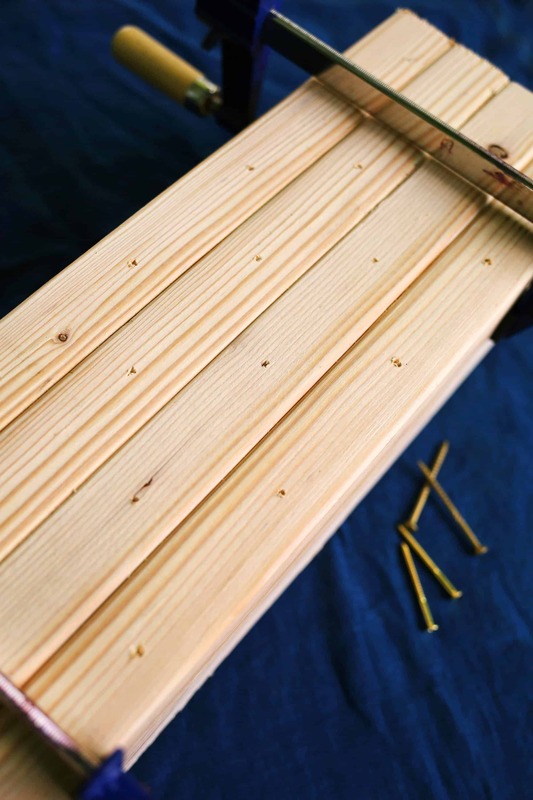 Measure 3″ to the left and the right of that point on the second and fourth boards, and then 3″ out again from those marks so that you have 5 marks on the second and fourth boards. For the first and third boards, find the center place between the marks on the second and fourth boards and mark those spots so that they’re centered on the first and third boards. This will create a diamond pattern overall with 6 marks on the first and third boards. 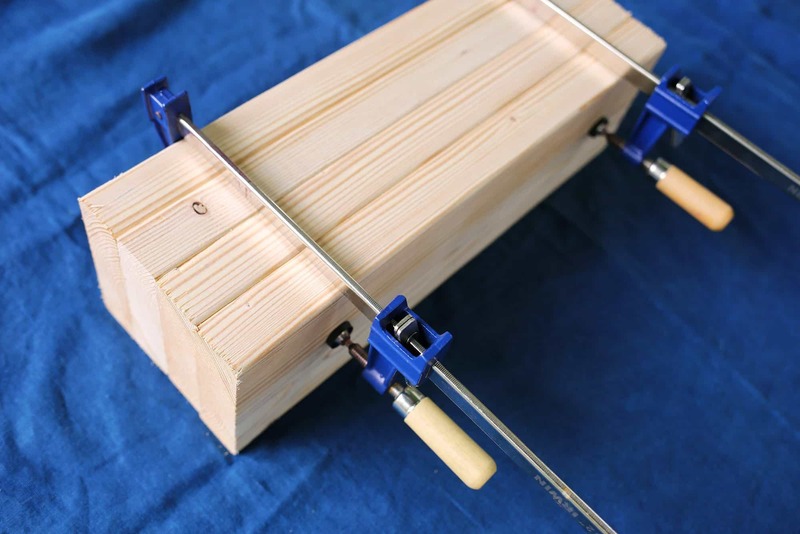 Clamp your block of wood to your work table. 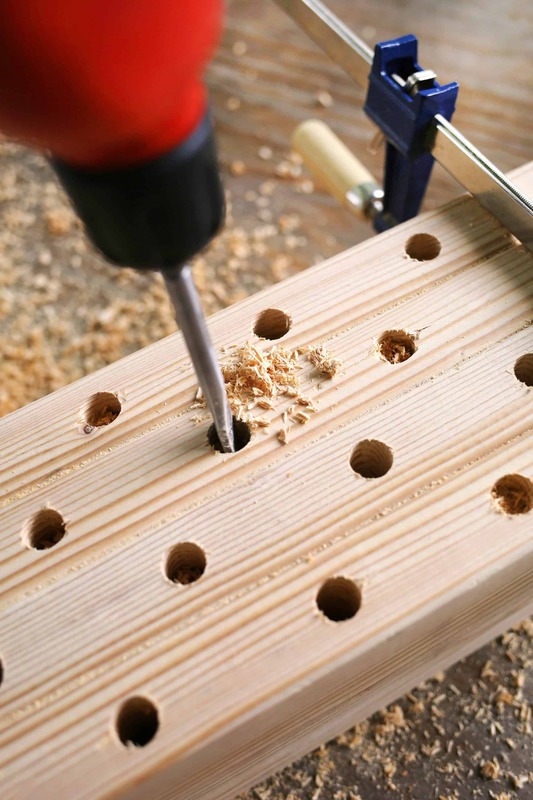 Use your 5/8 spade drill bit to drill about 4″-5″ down into your boards. Since this is such a deep hole, drill in about 1″ and then reverse drill back up to pull out the sawdust. Then drill down another 1″, reverse back out, and repeat. Otherwise you’ll pack so much sawdust down around your drill that it’ll get stuck. As always, practice safety precautions when using power tools. Remove sawdust as you go by flipping it over or using a long screw to pull it out. Sand down the front of your bee house. To smooth out the edges of your bee holes, wrap a piece of sandpaper around a pencil or screw driver and sand the inside edges of your hole. This is the general angle you’ll want to place your roof over your block of wood. Make sure it’s centered with a little overhang on each end. The back of the house and the back edge of the roof should also be flush so you can attach it to a tree or wall easily. 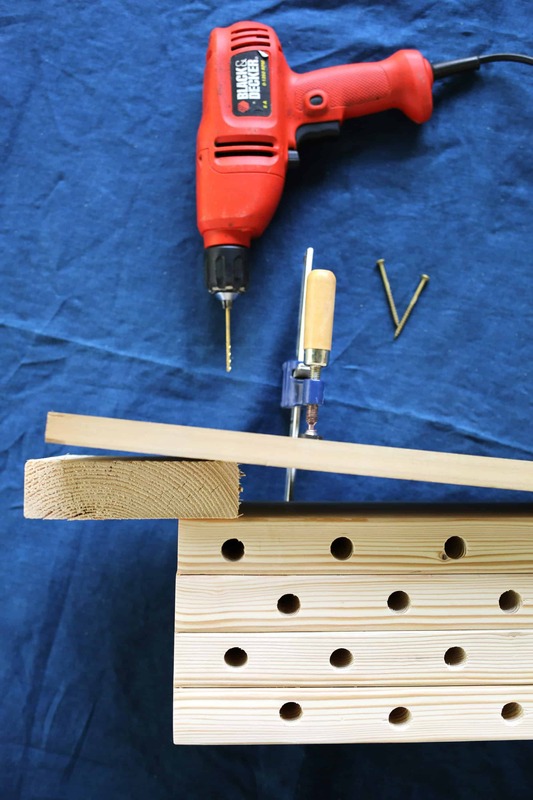 You’ll screw in your two shorter #8 screws (2″) down through the top of the roof about 1/2″ from where it rests against the block of wood and screw your longer two #8 screws (3″) down through the top of the roof about 1/2″ from the opposite end of the block. To make this angle easier, use a piece of your scrap wood to wedge between the block of wood and the roof and clamp it in place. Then pre-drill straight down through your roof and into your block. 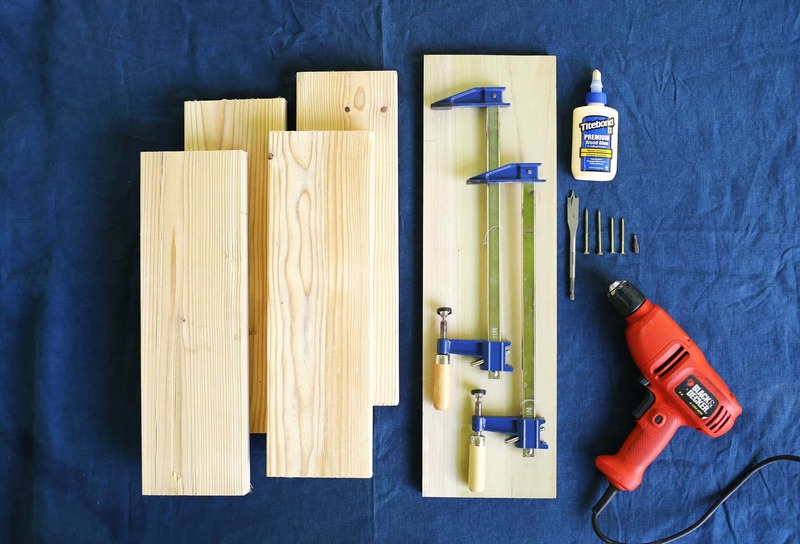 Add your 3″ screws so that they barely go into the block and then remove your clamps and scrap wood. Twist your screws down just a tad so that they are screwed securely into the block but so you still have that mid-century angle we are going for. Add your D-rings to the back of your bee home. You’ll want to place your bee home at least 3-4′ off of the ground to keep it out of reach of ground critters that might bother it. Unlike a bird feeder, you’ll need to mount this to a tree, post, or wall so that it’s fixed to a sturdy spot. Morning sun is best to help wake the bees up, so consider that when you’re searching for that perfect place. At the end of the summer you’ll want to clean out your bee home to keep things healthy and tidy for the next generation of bees in the early spring! Very cool – I think I could do this! My mom would love this in her garden. Thank you! This has got to be the coolest bee house I’ve seen. Excluding the perfectly shaped beehives in cartoons, haha! We’ve been planning flowers to help the bees, this will be there perfect addition to our garden! So quirky and cute! Juliette, Yes! It’s another layer of encouragement to help those bees get busy! It’s always fun to have a new project to customize for readers! This is such a cool idea. I’m thinking of gifting the supplies and instructions to my dad for his birthday as he’s always wanted something like this. I was quite surprised with how many adverts there were though. I viewed the post on my phone and 4 ads came up in between different photos and instructions of the post. Only mentioning this as usually I don’t notice that many. I totally understand though that you need to do adverts as this is your job and you’ve got to make a living. This is really cute! Great to do in addition to planting flowers. Idk I’m trying to repel bees from my garden… too many bees hanging out in my yard, then the wasps came! Honestly just planting a garden brings enough bees to the yard. This is so cool! Thanks so much! I am anxious to try this and teach my little one about one of the most important flying friends on the planet! I have a bat house too but have not hung it yet. Maybe that could be your next tutorial? 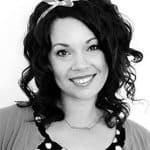 Love all your contributions to this site! Good question! 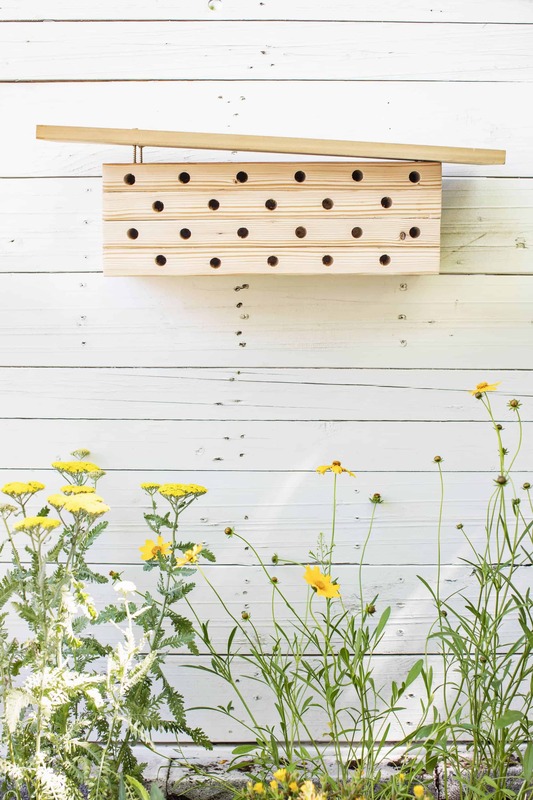 My husband is super allergic to honey bees so when I came across this option for mason bees, I got so excited! 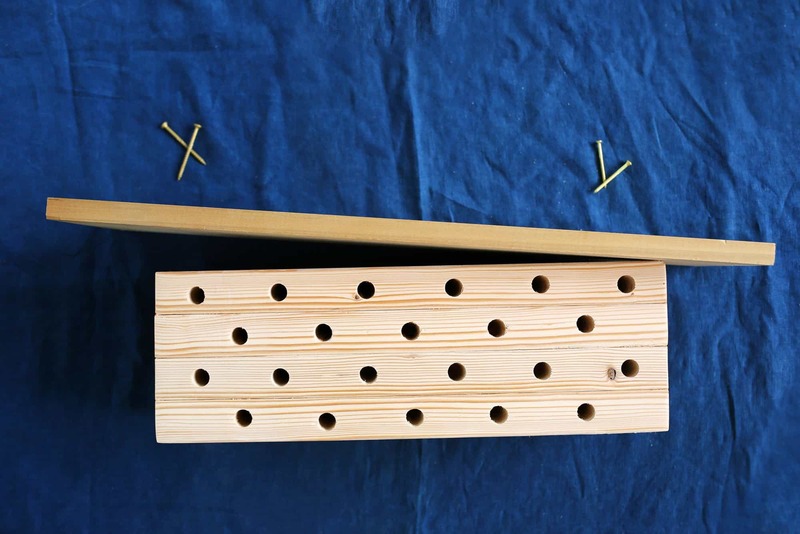 Mason bees naturally look for holes and crevices in wood to lay their eggs so providing a whole bunch of them in an easy location near a garden just makes it easy for them. They are also social and like to nest near each other so you will likely attract a few instead of just one random bee. They aren’t an aggressive species since they aren’t making honey that they have to protect so it’s very unlikely that they’ll bother you. My husband is allergic to honey bees so this was exciting to hear for me! I love this! And we do need more bees so yay. I made this bee house for my husband for our 5th (wood) wedding anniversary and it looks awesome! Very easy to follow instructions and the design is fantastic. Hmmm…None of the articles I read about mason bees mentioned needing a smaller hole and many of the models I’ve seen for sale online had a mix of large and small holes together so I didn’t think there was a size they preferred. You may be able to roll up small pieces of paper and stick them into the holes and then let them expand a little as they fill the space. This will not only decrease the width of the hole but you’ll be able to remove them and clean them out each season to prevent bee infections. Great tips Rachel – I will try the newspaper! Thanks again! And what a great gift idea for your 5th anniversary! Congrats!!! I’m curious haw this bee-home faired? 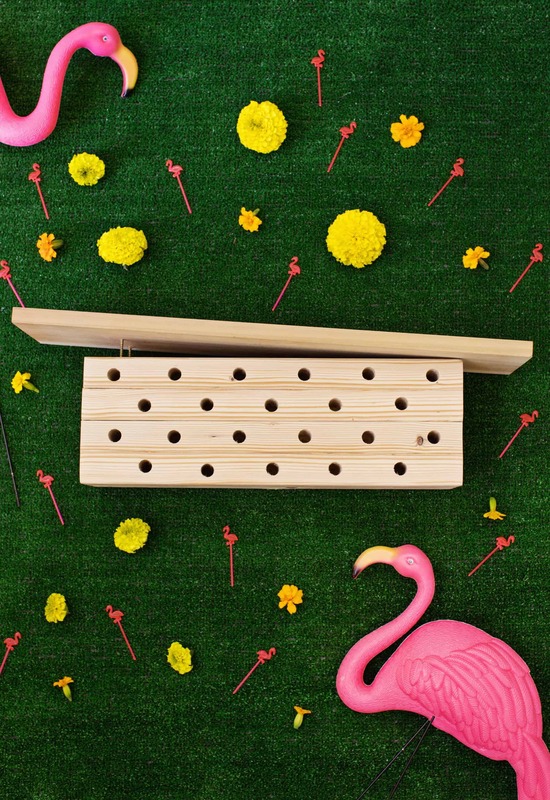 Did you get Mason bees? I have followed your website for years – even before I had one for myself. All bees are important and not everyone can be a beekeeper. But you don’t have to have a beehive…right? Your mason bee house would look good in my garden.